We've done some more exploring in the Elwha River Valley. We've got some new pictures. We've played around with some Photoshop filters. We've updated our web page again. We finally made it down to Hume's Ranch. For most people that isn't very spectacular, but for us it was quite a feat. We usually head towards Lilian Camp, but something drew us to the river this time. We even made our way towards the terrifying steel cable bridge, high over the Elwha, at Dodger's Point, but good sense asserted itself, and we backed off, squealing in terror. 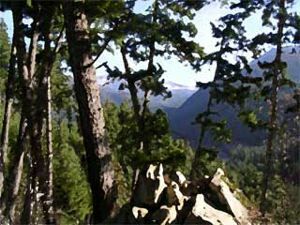 Check out the latest Kaleberg hiking trail report on the Elwha River Valley to find out more. 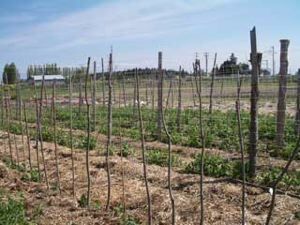 The peashoots aren't much to look at. The plants are still pretty small, but the flowers are blooming, and the shoots are still tender. We didn't even know that peashoots were edible until we had them in dumplings at Yank Sing in San Francisco. 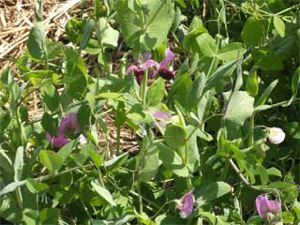 Pea vines seemed too fibrous for easy eating, and it seemed a shame to eat the shoots and then not have any peas. Now, we know that the young tendrils and leaves are delicious sauteed in sesame oil or olive oil, or just steamed. We add garlic or asian chives or soy sauce for a bit more flavor, but they are very simple to cook. We can wait for the peas, but the peashoots are here now. 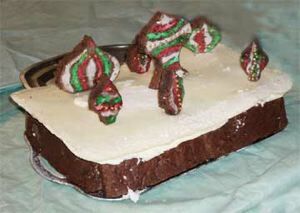 They'll be at the Farmers' Market very soon, so keep your eyes open, or drop by The Johnston Farm. This is the season for baby animals, and that includes ducklings and goslings. 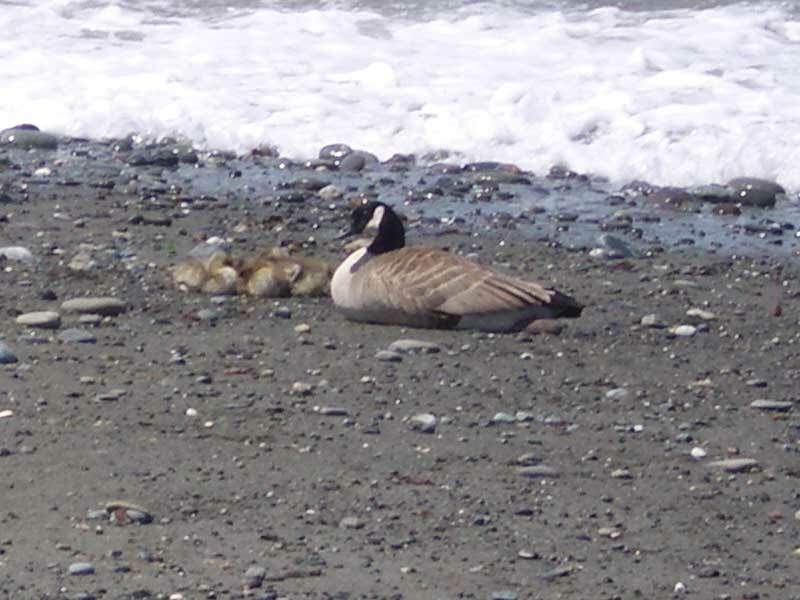 We were out at Dungeness Spit and nearly stumbled over this charming family scene. 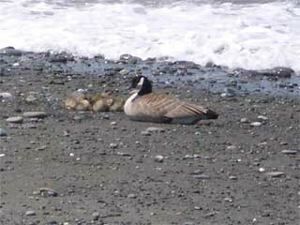 It was an hour or two after low tide, and there they were, right along the water, a family of goose, gander and goslings. 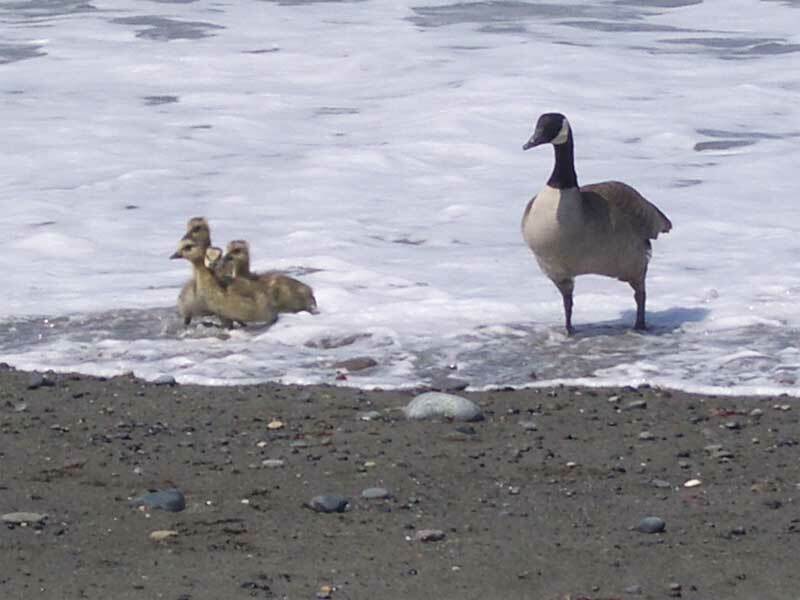 They were resting on the sand when the waves came in, and they all scrambled. We were driving out to Lake Ozette and trying to figure out how to use the cruise control. We think we found the enable switch, because some green light on the console did light up as we remembered, but we just couldn't figure out how to tell the cruise control to actually engage. Cruise control ties up three buttons on the steering wheel, and surely it could be made simpler to use. While struggling, we pondered why these things are so hard, and why it takes someone like Steve Jobs to make simple things simple. Perhaps, we considered, Thomas Edison's greatest invention wasn't the light bulb, but the light switch. Candles require a match, or a flint box, to light. Oil lamps, and even gas lamps, are no better. If you wanted electric lights, you had to power up the generator, and that probably made starting up a lawn mower look simple. What Edison did was invent the light switch. Push it one way to turn the light on. Push it the other way to turn the light off. That's sort of amazing. It's really simple. 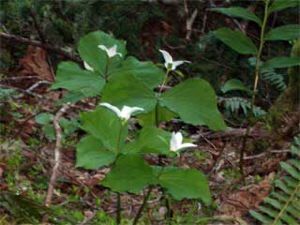 Last year there seemed to be an awful lot of trilliums along the Lake Angeles trail. This year, there seem to be an awful lot of triliums along the Spruce Railroad trail at Lake Crescent. Keep your eyes open. 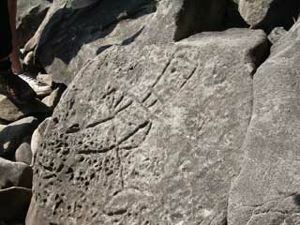 A lot of them are along the slow ascent at the eastern end of the trail, and it is easy to miss them with all the ferns and shrubs. Also, keep your eyes open for salamanders. They are out there, especially on wetter days. We are just back from the Farmers' Market, and we have to report that spring is moving along. 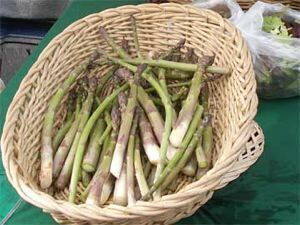 Westwind Farm has the most amazing asparagus. We've never tasted any this good before. Go for the big fat ones, if there are any left when you get their. When you get them home, peel them and steam them, or boil them. Also, this may be the last week they have their nettles, so hurry up if you want to dry making nettle soup or ravioli. 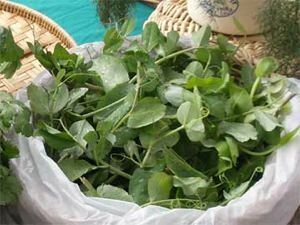 The Johnston Farm is selling pea shoots, a sure sign of the season. They also have their baby potatoes, lots of herbs, carrots and coriander. Harley at Dry Creek Farm says that his salad greens are doing nothing, but he does have his eggs. His organic oats are also doing well, but the cold weather has slowed things. Nash Huber has great looking Swiss chard and lots of little cauliflowers. We bought three bunches of the stuff, so we'll be making our Swiss chard and tuna spaghetti again real soon. 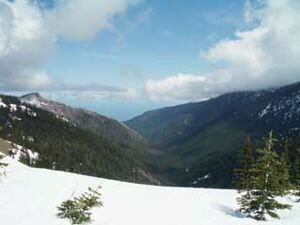 Did we mention that there is still snow on Hurricane Ridge? We were out snowshoeing. The snow is getting a bit crunchy, and the trail is pretty messy, since most people, less clumsy that we, are just wearing hiking shoes on the trail. 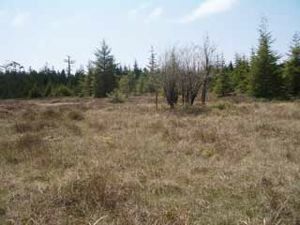 The road is still only open on weekends (call 360 565 3131), but the drive is worth it. It is still mighty pretty up there. 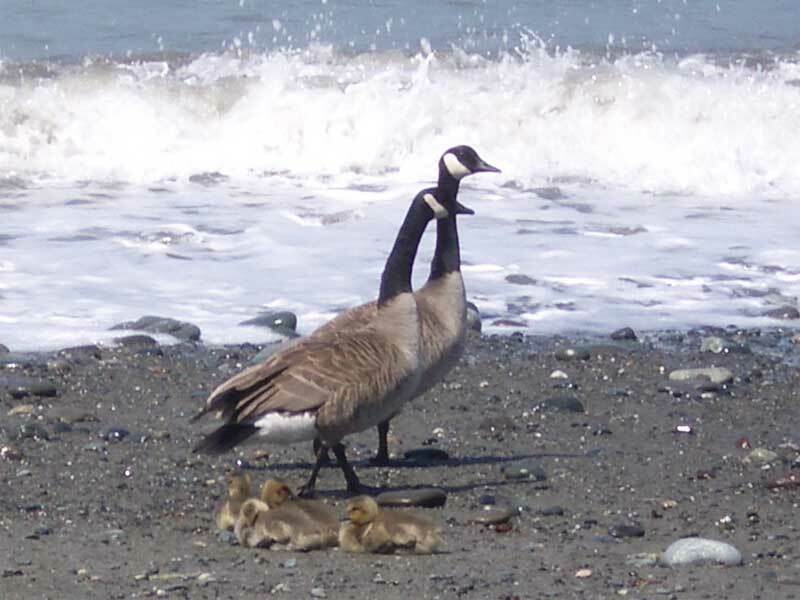 We took advantage of the morning low tide to explore the Dungeness Spit. It was a real low tide, with lots of beach, so we were able to walk out to the two mile marker and back mostly on nicely compacted sand. In the winter, the tides tend to be high, so most hiking is done up at the high end of the beach near the piles of driftwood that collect there. In the warmer months, the tides tend to be lower, so we hike down towards the water, and driftwood is well up the beach. 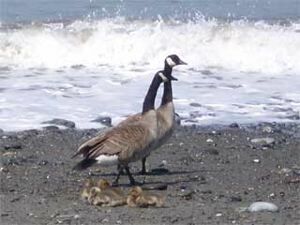 That means that it's easy to get hypnotized by the sand and restless water, and not notice any eagles perching on the driftwood above. 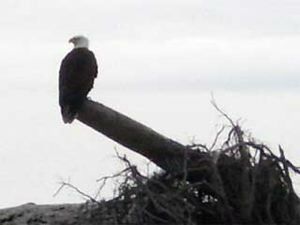 This time, we looked up, and there's a photo of the bald eagle we spotted on the left.